As promised, the interviews I did with five astronomers at the Wild Stars in the Old West II conference are now coming online, thanks to my friends at Slacker Astronomy, Michael Koppelman and Doug Welch. The first part of the series is now available. The first interview in this episode is with Brad Schaefer from LSU. Brad is very excited about the results of his research on recurrent novae. These cataclysmic variables grab our attention and spark our imaginations because of the incredible amplitude of their outbursts, typically 8-12 magnitudes, and the rarity of these spectacular events. Many of these outbursts are once-in-a-lifetime events. Like an apparition of Halley's comet, witnessing an outburst of T CrB twice in a lifetime would be a matter of uncommon luck, longevity or both. 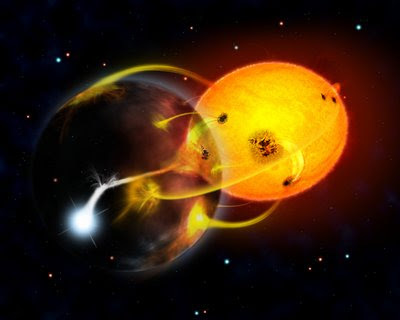 Artist's depiction of the recurrent nova, RS Ophiuchi, in outburst. (Illustration Credit & Copyright: David A. Hardy & PPARC; Astronomy Picture of the Day 2006 July 26). I've written about recurrent novae before. 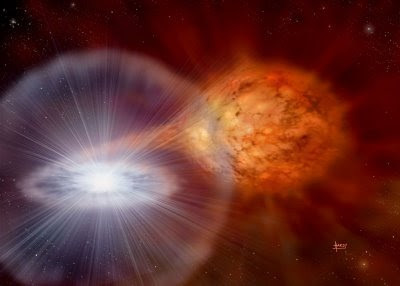 The cause of a nova eruption is a thermonuclear reaction on the surface of the white dwarf. After years of mass exchange between the binary pair, temperature and pressure at the surface of the white dwarf build sufficiently to cause the layer of accreted material to explode like a hydrogen bomb. This bomb, however, can have the mass of 30 Earths! Once the temperature becomes high enough, this layer begins to expand. Minutes into the process the shell can be radiating at 100,000 solar luminosities and expanding outwards at 3000 km/s. Eventually the shell envelopes the entire binary and the orbital motion of the pair acts like a propeller to whip things up. After 1000 days or so the envelope expands to the point it can be seen as nebulosity surrounding the pair. Over hundreds of years the shell dissipates into the interstellar medium. Most novae probably erupt more than once in their lifetime, with the mass of the white dwarf determining the amount of accreted material that needs to accumulate before triggering on outburst. Systems with a white dwarf of 0.6 solar masses might take as long as 5 million years between eruptions. A system with a 1.3 solar mass white dwarf might only take 30,000 years between eruptions. Systems with recurrence times of 100 years or less probably have very massive white dwarf primaries. With so few known examples and the rarity of these events it is no wonder that recurrent novae eruptions are extremely interesting to astronomers. Monitoring these stars for outbursts over decades of relative inactivity is still one of the extremely valuable contributions visual observers can provide to science. The second interview is with Steve Howell, of NOAO. Steve and I talked about the advances that have been made in CV research since the last Wild Stars meeting ten years ago. I also asked him where he thinks new research is heading. But, I have to admit, I really wanted to talk to him about his awesome image of magnetic accretion. I saw this in his poster presentation at the meeting and was blown away by the whole concept of the complicated, beautiful way mass is accreted in polars. I hope you enjoy the podcast. My sincere thanks to Michael, Doug, Brad and Steve for making these Simo-interviews possible. I really liked this interview. Particularly useful for me, as I went to see David Levy on Saturday, and one of the topics he discussed was recurrent novae! David always does a good talk. We need more people like him to encourage and inspire observers.